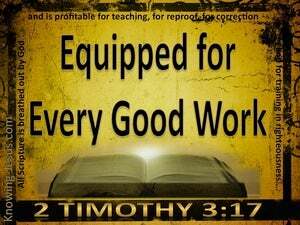 As Paul prepared to leave this world, his deep desire was to ensure that believers, like his spiritual son, Timothy, were properly equipped to face the influx of false teachers and demonic doctrines, that were flooding the churches. 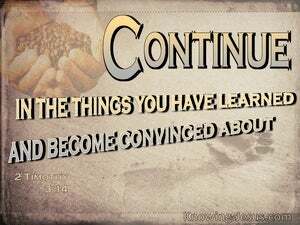 Paul knew that perilous times were coming on the Church, when apostasy would be rife within Christendom. 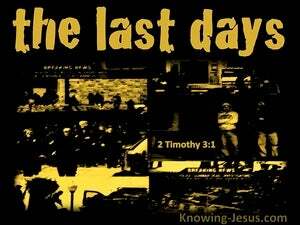 He warned Timothy of the many identifying factors, which would characterise the end of the age. Men and women would be selfish, conceited and egotistical. They would be greedy for money, and display pride and arrogance. 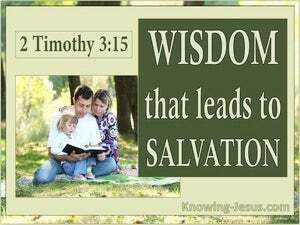 They would blaspheme God and be disobedient to parents - and they would be unthankful, unholy, unloving and unforgiving. 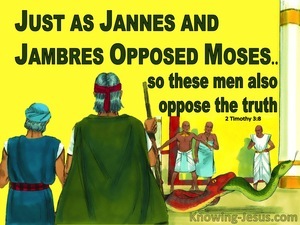 Opposition to the word of truth and the testimony of God is as old as the hills and hostility toward the Christian faith, the church of God and the truth of the glorious gospel of grace continues to rumble around the globe today and ravage many ministries – just as it did when Moses led the children of Israel out of Egypt. While Paul gives a resounding call to patience endurance in life's difficulties; purity in personal conduct and faithfulness in Christian ministry, he is equally eager to warn us of perilous times ahead - the ploys of the enemy to shipwreck our faith and the insidious dangers of false teachers. We live in a fallen world and there are many challenges that face the believer, who has not only trusted Christ for salvation – through the forgiveness of sin, but is also ready and willing to deny self, take up his cross, follow Christ’s example, and say without compromise – Thy will not mine be done. 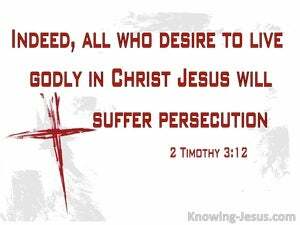 I am sure as Paul reflected on his life, in that dark, dank, dreary dungeon in Rome, his heart was gladdened when he thought of Timothy, his spiritual son in the Lord. 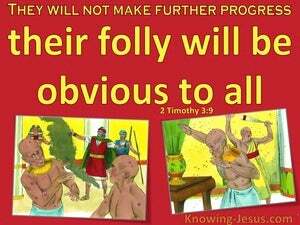 But Paul also recognised that the days were becoming darker, and increasingly evil, when men would become lovers of themselves, would not tolerate sound doctrine and would pursue false teachings, and the philosophies of Satan's fallen world system. 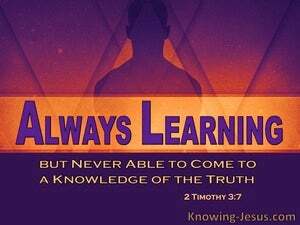 Timothy had not only been taught the Scriptures from childhood, but had come to know and become personally convinced of the veracity of their content. What an wonderful example his mother and grandmother proved to be - and yet such godly witness of the truth of God's word.. should be the norm for every Christian mother, father and grandparent. As we thumb through the pages of Scripture, which have become so familiar to us, it is a challenging and awesome thing to consider Who it is that lies behind those inspired pages and the eternal significance of their content. 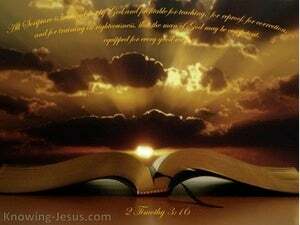 The written Word of God is not just a collection of curious books penned in antiquity. In a world where satanic deception, doctrines of demons and multitudes of false teachers, apostles, prophets and priests seek to shipwreck the faith of Christians and render their lives fruitless - the inspired and inerrant Word of God is profitable for sound doctrine, godly correction, spiritual growth and instruction in righteousness.